John Steven’s Tavern – eating my way through Charm City! I have heard that this place has a good crab cake. Plus with as much time as I spend at The Point, it has been beckoning to be highlighted. We sat on the bar side, and had mediocre service. I don’t expect the best service from a busy bartender, but I don’t want to wait 10 minutes after ordering a beer – only for you to bring it with the check. I was ravenous. I am mostly sure I said “I’m hungry” about 18 times walking the half block to the restaurant and probably another 14 times while waiting for our waiter. I probably told the him I was hungry another 5 times while I ordered a large glass of water. 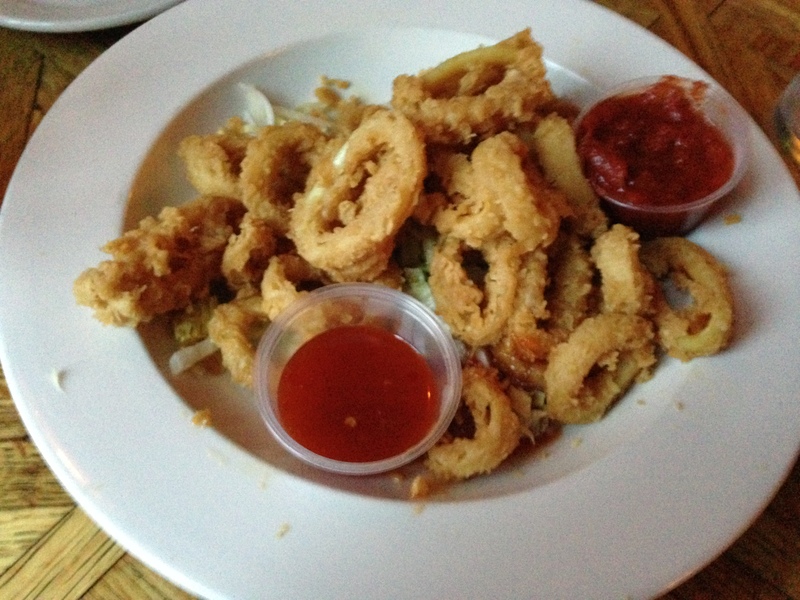 Luckily, we quickly agreed on the fried calamari and ordered it when we placed our drink order. The calamari was cooked fine and was not chewy, but the breading was bland and fell off as soon as you picked it up with a fork (or your fingers). They consider this traditional, but the dipping sauces were equally boring – cocktail sauce and a sweet and sour sauce. Thank goodness for the lemon to give a little flavor. My friend an I also split the rib and crab cake special, adding on and extra crab cake – which came with rice and an old bay ear of corn. The ribs were fine; the meat was fall off the bone tender and the sauce was mellow. I was hoping for some tangy or acidic bbq flavor in the sauce or some smokiness deep in the meat. Instead, it tasted more like the meat was cooked separated and then slathered in the sauce as an after thought. 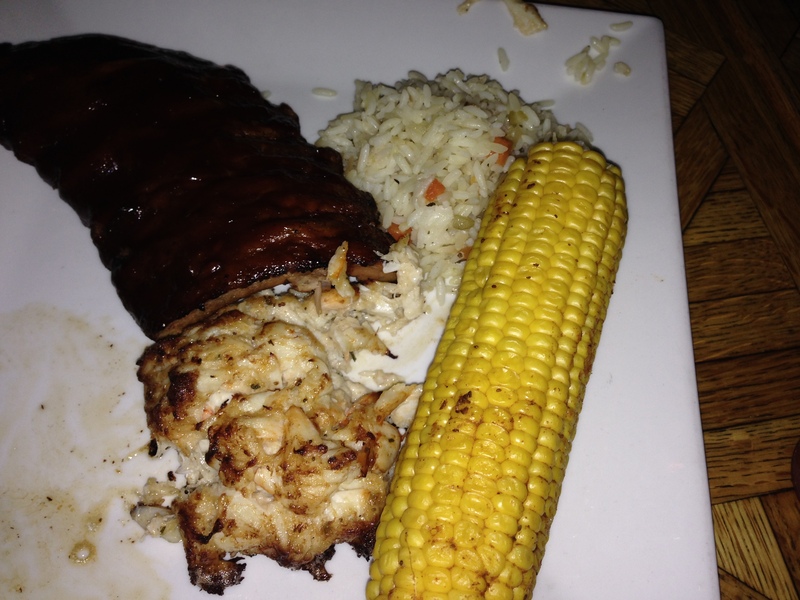 I must confess – they tasted great to me, but then again, I can’t remember the last time I had ribs to compare them too. The crab cakes were small. I like the robust crab and old bay flavor. They are Baltimore style with the jumbo lump crab and little filler giving it a decent texture, but on this Thursday, the binding ingredients left the crab cake a little more liquified than I like. I still ate every single bite. I didn’t try the rice; it looked like something I would get in a lean cuisine. The corn was dry. The butter an old bay helped. Not the raven’s fault. It is May and not quite the right time for that flavorful local corn. How could I have forgotten to tell you about the oysters? Oh. Right. They were not very memorable. We had three from the Deleware Bay – they were on the sweet side. It’s not particularly oyster season, but I have had better oysters than these this week. Overall, I was not impressed and the place was pricey – we had a few beers, split an app and an entree and it was almost $80. *this post had some help from L.T. Grant. This entry was posted in Charm City, Dinner, Fells Point, Meh.. Bookmark the permalink.